Mike Smith of Global Marine Insurance talks about the Federal Maritime Laws and how they dictate what’s required on your boat owner’s insurance policy. He also discusses how to read your policy and why agreed value is a better deal. When it comes to buying a boat, the most important thing to do is include your spouse, significant other and family members in the buying process. Capt. Chris Kourtakis, of H2o Limos explains why this is so important and how it affects the type of boat you’ll buy. Whether you own your own boat and want to rent it out, or just looking to rent a boat during the season, Brian Stefka of RentbyBoater.com walks you through the process. It’s always a good idea to get a marine survey done on a boat you are seriously considering buying. Insurance companies require it and so do some banks depending on the type of financing you are getting. Rob Scanlon of MasterMarineSurveyor.com talks about the various surveys and what to expect from your hired surveyor. Ocassionally electrical requirements change and when they do, you want to make sure you upgrade your electrical panels to handle them. Depending on how many changes you make, it might be easier to have a custom electrical or instrumental panel made just for you. Mark Rogers of WeWireBoats.com talks about how easy this is to do and what to keep in mind when having a new panel designed for your boat. Search and Rescue (SAR) is one of the most important procedures that involves everyone on your boat. Modern technology is making it easier and easier for everyone to be rescued in a timely manner. Captain Chris Kourtakis of H2olimos.com discusses just what all those acronymns mean, how they work and what you need to do to be proactive in getting found in an emergency. It’s a lot of fun being out on the waters in your boat. But, every so often, there’s a storm that comes through with the potential of ruining your day. Timothy Wyand, writer for examiner.com, gives us insight on the different types of bad storms and what to pay attention to. If you only had three steps in faciliating a SAR mission, making sure you bought and registered an EPIRB would be considered the final step. Alan Sorum, featured writer for Suite101.com, walks us through how an EPIRB works in a Search and Rescue mission. As in any major purchase, figuring out the best way to pay for your boat and how much you can afford takes some homework. The rules have changed since 2007, but for the better. 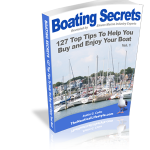 Jim Coburn of Coburn Associates walks us through the steps of financing your boat, what’s expected from the banking institutions, types of interest rates available, and more importantly, what not to do to lower your credit score. Sailing isn’t just about monohulls anymore. Two new categories that are taking over our waters are the catamaran and trimaran. Jim Brown, marine architect and boat builder, tells us stories about how these multhulls have transformed from early days. Jim also gives us great insight as to which multihull will be around for a long time to come and why. The pay still isn’t as high as other professional sports, but it’s getting there. According to Brian Hancock, if you have the skill and the time – you can make a decent living sailing the ocean blue. Brian is arguably one of the most experienced offshore sailors in the United States, logging over a quarter million offshore miles racing both fully crewed and solo.